We hear a lot about reducing our carbon footprint, but do we ever talk about reducing carbon paw prints? If you’re a pet owner who wants to take the extra step in becoming more environmentally conscious, then check out the eight eco-friendly products below. 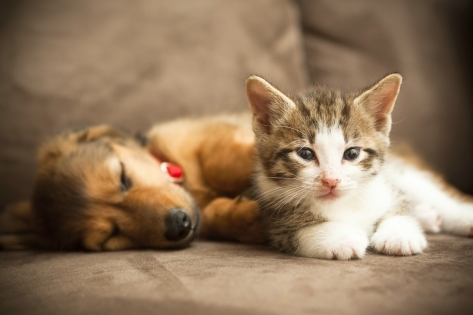 Keep your family cat or dog in the loop by including them on going green. Honest Pet Products offers an organic catnip-infused toy for any feline who has some extra energy to burn. 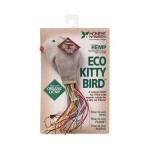 The all-natural Eco Kitty Bird is created with hemp canvas and colorful strands of hemp twine, making it anti-bacterial, safe and durable for your furry friend. In lieu of plastic cat toys that are eventually lost under a stove or couch, consider giving your cat Eco Kitty Bird and let your pet have clean, sustainable fun. 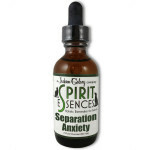 If your pet suffers from separation anxiety and consequently destroys everything when you leave the house, then Spirit Essences has a product you might be interested in. The company’s Separation Anxiety Remedy comes in a 2 ounce bottle filled with several herbal essences, and bit of Reiki and Lakshmi energies, that may help eliminate anxious behavior caused by separation anxiety. See if this product can help your pet overcome the jitters and make less noise when you leave your home. Harry Barker, a company founded by Ford model Carol Perkins after being diagnosed with Cushing’s Disease, uses 100 percent post-consumer recycled plastics in its products, specifically its Fold-Up Dog Bowls and Pouch. 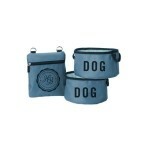 With its reverent roots, Harry Barker began creating collapsible travel bowls for pups on the go. The Fold-Up Dog Bowls and Pouch come in three colors and are customizable with your pet’s name – up to eight characters – for extra flare. Fill the portable dog bowl with water and let your canine hydrate anywhere. To start, The Honest Kitchen’s Sparkle Shampoo Bar is solid – literally. Since the shampoo isn’t liquid, it doesn’t take up as much space and cuts down on wasteful plastic packaging. The shampoo is made of natural, botanical ingredients that are sensitive to any cat or dog’s skin. Sparkle Shampoo Bars come in three scents, each having specific advantages: apple cider vinegar, as an anti-irritant; diatomaceous, with healing compounds; and lavender, that leaves fur smelling pleasant. Next time your pet is dirty or smelly, try The Honest Kitchen’s Sparkle Shampoo Bar and see if it makes your pet clean and sparkle. Almost every cat, kitten and cat-loving human enjoys playing with toys. Bambeco’s Smidge toy mouse, made from 100 percent recycled, synthetic fabric, is packed with USDA organic catnip and is shipped completely carbon-free. Not only are you getting an irresistible toy mouse when you buy Smidge, you’re also supporting a company that plants a tree for every product sold. If you’re looking for durable, recyclable and made-in-the-USA dog toys, then check out Planet Dog’s RecycleBall Value Pack. The product is a sustainable spin on a classic toy. It is made from 100 percent recycled injection-molding material, eliminating waste from an essential manufacturing process. 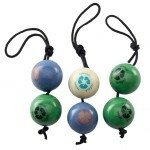 The RecycleBall Value Pack comes in a bundle of three, with two recycled balls and upcycled climbing rope. Try this item out with your dog, and if your pup doesn’t like it, no sweat. Planet Dog has a 100 percent guarantee. For anyone who has shopped with Muttropolis, you know there is something available for any dog in your house. Petkin’s Eco Potty Pads, available through Muttropolis, is the solution to any pet owner trying to potty train a puppy. The Eco Potty Pads are made from bamboo, so it dries quickly, is absorbent, naturally deodorizes and attracts pets with essences and pheromones. Eco Potty Pads, in short, are an Earth-friendly option for puppies being house trained. If you’re tired of your feline companion napping on your favorite sweater, try out West Paw Design’s cat bed. Every bed made by West Paw Design is sewn by hand in the USA and is stuffed with recycled materials. Where there isn’t recycled materials, organically-grown cotton, catnip and hemp is used, keeping waste down. The Tuckered Out cat bed is easy to care for and can be put in a washer or dryer.